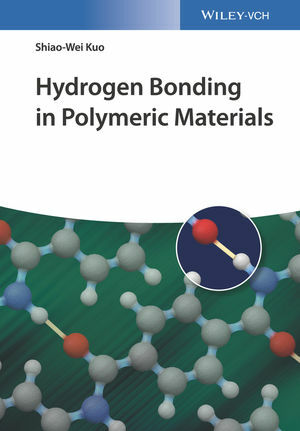 Summarizing our current knowledge of the topic, this book describes the roles and effects of hydrogen bonding in polymer materials by reviewing the latest developments over recent years. To this end, it discusses all relevant aspects from the fundamentals, via characterization, to properties and applications in various polymeric materials, including polymer blends, block copolymers, mesoporous materials, biomacromolecules and nanocomposites. Invaluable reading for scientists in polymers and materials as well as those working in macromolecular chemistry. Shiao-Wei Kuo is Professor in the Department of Materials and Optoelectronic Science at National Sun Yat-Sen University, Taiwan. He received his PhD in Applied Chemistry from National Chiao-Tung University, Taiwan. After some years of postdoctoral research work there and in the University of Akron, USA, he joined National Sun Yat-Sen University as a faculty member. His research interests include polymers, supramolecules, self-assembly nanostructures, mesoporous materials, POSS nanocomposites, low surface free energy materials, and polypeptides. He has published over 300 research papers and several book chapters.